The Creative Bar was honored to be selected as a winner in the 2013 American Graphic Design Awards for their work with client, Intense Cycles. Marking our fourteenth (14) national design & advertising award in 2013. For five decades, Graphic Design USA has sponsored national design competitions spotlighting areas of excellence and opportunity for creative professionals. 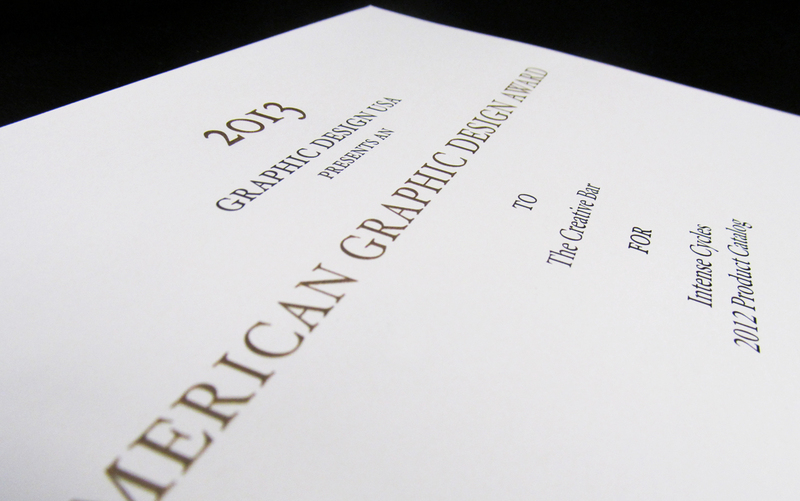 Of these, the American Graphic Design Awards is the biggest and broadest of these, honoring outstanding design. Intense Cycles is a state of the art bike manufacturing factory located in Southern California, that prides itself in custom designing and manufacturing bikes. Making it their own personal mission to design and refine each model to achieve the highest possible level of performance and craftsmanship. Working closely with industry leaders and professional racers to utilize the latest technology to provide a product unmatched by any competitor.